BoA Travel House i Seoul, Sydkorea : Boka nu! If you cancel at least 10 days prior to check-in, you can get a full refund and 9∼5 days prior to check-in, a 50% refund. Within 4 days, there will be no refunds. 2014, 2015, 2016, 2017 Travellers' Choice by Tripadvisor for 4 years in a row! 2012 Newly opened the largest independent accommodation in Seoul. 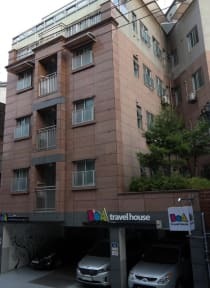 BoA travel house is located in the most popular area, Hongik university in Seoul. Single and family room are arranged. Just 5 minutes walk from Hongik univ. station exit no.4 that is right connected to airport railroad. Just 10 minutes walk from hongdae area, Seoul's most vibrant, artistic and progressive district. There are many shops, cafes, restaurants, clubs, bars, convenience stores, street performing and everything you want. You can enjoy exciting nightlife easily, but guesthouse is far enough away for you're quite good rest. Halal Korean Food Restaurant is located on ground floor(Closed for a while). Muslim friendly : We have cooking utensils and prayer room only for Muslim customers. Smoking is NOT ALLOWED in the whole building except the roof garden and parking lot. Check in : From 15:00. Self check in after 16:00. Check out : Before 12:00. Please let us know 1 day prior to check out if you need to check out before 9AM. Smoking is strictly prohibited except roof garden and parking lot. The guest who causes displeasure someone or goes against proper religious and cultural etiquette is subject to be checked out compulsively.